A year since I last reported on the fundraising activities of Trowbridge Group so a lot to fit in. Firstly, it is with great sadness I have to report the death of our very dear friend and Trowbridge Committee member Reg Jefferies. Reg was a long time supporter of BCUSG serving as a Trustee of BCUSG for a number of years as well as a valued member of Trowbridge Committee and forged strong links with supporters in Frome. He travelled many miles meeting potential fundraisers and promoting our activities, ensuring we got maximum publicity through posters, tee-shirts etc. He was instrumental in setting up our Website. We still miss him a lot not least of all his smile. We are extremely grateful for the support we get from our local Shopping Centres and Supermarkets without which we would not be as successful as we are. Once again we manned the butterfly table in Castle Place in the run up to Christmas and together with a bric-a-brac stall we raised £4,644. We also collected a further £207 in June. Customers in The Shires put £106 into our buckets placed in the Christmas Grotto. Our thanks to customers at Morrison’s Warminster who donated £384 and at TESCO’s Trowbridge £925 whilst we collected £634 at Sainsbury’s Odd Down. 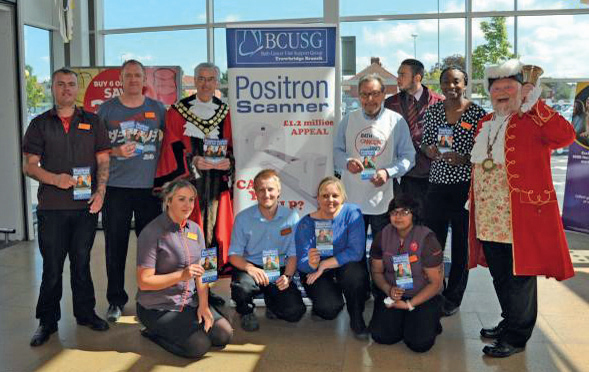 In May 2015 Sainsbury’s in Trowbridge nominated BCUSG their Charity for the Year and as well as the in-store fundraising (amount still to be notified) we were allocated three Collections when customers donated £2,789. Meanwhile we recently received £600 from the Nationwide Community Support Scheme which is a result of being nominated by customers. Our very sincere thanks to the Management and shoppers at all these Stores. I have thanked Pearson May Accountants on many occasions because we have benefitted from their annual Golf Day for so many years I’ve lost count. This year we received £1,112 plus they also sponsored balloons which we hand out to children at all our events thus helping with fundraising. When people come forward to organise their own events for BCUSG we try to support whenever possible. A number of members attended the dance at Trowbridge Rugby Club organised by our friends Richard and Joan Randall. A good night I believe which raised £1,012. Another event with a dance theme was organised by Joanne Craddock and sister Sandra but this time it was a Barn Dance at Hilperton and she sent a cheque for £500. Diane Sharpe’s a keen dancer and went along to this one. Another regular event is the BBQ at Trowbridge Cricket Club and the Committee was well represented at this event and they handed over £758. Pat Smith succumbed to pressure (often from me!) and held her annual Cream Tea in Rode assisted by a band of happy helpers she raised another £420. Will she do another one is the big question?? £210 was raised at Barbara & Ken Pickard’s Christmas Coffee Morning and Maria Giuliani ran in the Bath Half and sent us her Sponsorship money of £205. Our grateful thanks to everyone who organised and supported all these events. Tino Polledri and I were delighted to attend a meeting of the Trowbridge Sugarcraft Guild and accept a cheque for £450 from their annual Christmas cake sale. Tino then accepted a cheque for £200 from Trowbridge Lions who have supported BCUSG for many many years. Regal Court’s raffle proceeds of £32 came our way as did £100 from a coffee morning organised by 3rd Holy Trinity Guides. Tino told staff and students about the work of BCUSG when he attended Manor School in Melksham to pick up a cheque for £363. 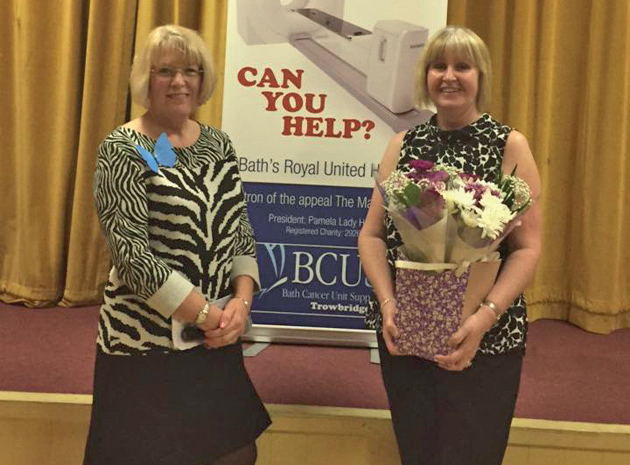 Sadly the local Sunday Club was forced to close this year but they awarded their remaining funds to BCUSG and Diane attended their final lunch to pick up a cheque for £244. Thank you everyone. £243.26 was added to our funds from collecting boxes and our thanks go to the following businesses. Sharpe & Fisher; Shires Sweet Shop; Ayrton & Farley Hairdressers; Griffin Hotel, Frome; Travis Perkins the Westbrook Pub, Bromham and the Market Café in Trowbridge. Please get in touch if you can display a box for us. Committee fundraising got off to a good start in 2016 as we raised £225 from the Raffle at our Annual Post Christmas Dinner. A lovely evening with entertainment provided by a choir from St Lawrence School, Bradford on Avon singing ‘Songs from the Shows’. 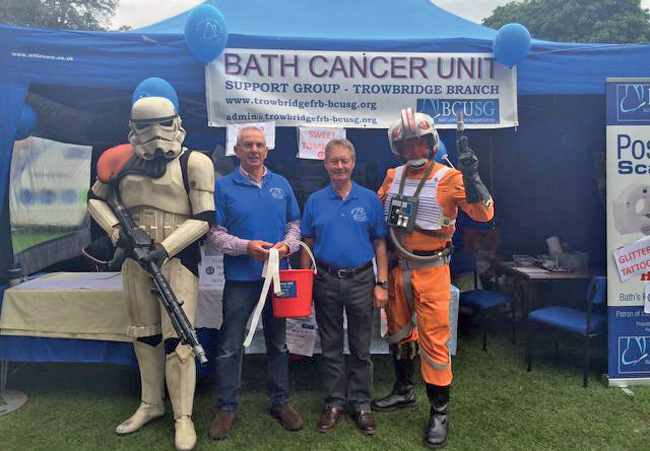 As well as standing with collecting boxes the Committee have been present at most local town events in Trowbridge Park including the Magna Carta Weekend when a children’s stall raised £224 and at the recent Armed Forces & Veterans Weekend. Again the stall targeted children and Kim & Marie learned a new skill to add to their CV. i.e. painting on Glitter Transfers. It was a two day event and despite not having the best of sites we raised £545. This year Marie initiated a competition whereby schoolchildren were invited to submit a design for our Christmas cards and how well they did. (See separate item) Although we were a little late getting them on sale they still raised £250. Well done to all the children who entered. Ian celebrated his ‘65’ with a ‘Just Because’ birthday bash and never one to miss an opportunity to raise a few pounds he sent a bucket around and friends dropped in £115. Also celebrating this year was our BCUSG photographer who many of you will have seen clicking away at most of our events. Geoff & Pat Parselle celebrated their Golden Wedding Anniversary and friends donated £110 to BCUSG. Congratulations Ian, Pat & Geoff and we hope you celebrate for many years to come. The Mediumship Evening organised by Diane was something very different. Joanie Goddard selected people at random from the audience and was able to read things about them. I have to admit being very sceptical but when she did pick on me she was pretty accurate in the things she knew about me which she could not have known before!!! How?? Anyway Joanie gave her services free enabling us to bank £1,202 from a very interesting evening. Well done Diane and thank you Joanie. Robin Davies a former Committee member has taken up woodwork and as well as providing bowls and plates for us to sell he also sent us £155. Joan and Richard Randall sold surplus apples to a neighbour and donated £15. A colleague of Joan’s had a ‘Summer Gathering’ and a bucket collection resulted in £181 so thank you Debs Marrison-Wood and all your guests. Peter Burnett celebrated his 80th Birthday and asked well-wishers for donations to BCUSG in lieu of presents. This resulted in a cheque for £250. Congratulations Peter and good health in the future. The Lamb in Trowbridge held a Raffle and we received a cheque for £375 and the Elbleg Twinning (Polish) also sent proceeds from their Raffle £213. A cheque for £30 arrived from Widcombe After 8’s Skittle Team. Whilst the Friends of Trowbridge Museum sent £90. Other donations came from Jill Gay £100; Pia McGee £20; John Taylor £100; David Payne £100 and Frank Clewett £100. Caroline Fraser sent us a wonderful cheque for £1,000. Thank you all so very much for your support. A huge round of applause is due to our brilliant team of Skydivers. Last September between them they raised around £8,500 (including Gift Aid). Take a bow Amy; Chelle; Glenn; James; Kim; Sam and Tracey. I can’t believe some of you are even doing it again this year. (I wouldn’t do it if you gave me £8,500). Please note if a Skydive is on your ‘bucket list’ then it’s not too late to Register for this year’s event on Sunday 25th September. The high point of the year has obviously been the opening of the new Positron CT Scanner by Mary Berry and along with the Trustees, Trowbridge Committee of BCUSG is feeling very proud. We also hope that all our wonderful supporters can feel that same pride because without them we would not have achieved our goal. Trowbridge members sold £1,070 worth of Raffle Tickets and we were pleased so many winning tickets for Mary’s signed book came from our area. However, we were especially delighted that one of the two first prizes was sold in Trowbridge to the mother of Sam and James two of our Skydive Team. Read more about this elsewhere in Supportline. A final but sincere thank you to all those who have donated money in memory of loved ones but I hope you can take some comfort in knowing the money will go to helping many local Cancer sufferers being treated at RUH.